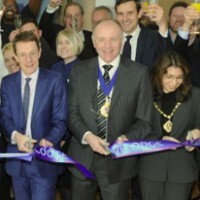 Our Executive Chairman John Woodhall was delighted to attend the official opening of the new Walsall Travelodge by Andy Street, Mayor of the West Midlands Combined Authority, Mayor of Walsall, Marco Longhi and Hannah Thomson, Travelodge, People Director. Wakemans acted as Tenant’s Agent, on the purpose-built 60-room hotel, which represents an investment of £5 million for the landlord and has created 12 new jobs. This key development is also helping to rejuvenate derelict land along the ring road corridor. With the launch of the Walsall hotel – and that of a new hotel in Solihull – Travelodge now operates 25 hotels across the West Midlands. These two new additions to its portfolio mean that the budget hotel group’s UK network now numbers 580 hotels. The West Midlands is a key growth area for Travelodge as it is attracting a record number of visitors year on year yet there is still a shortage of quality low cost accommodation in the region. To meet growing demand Travelodge is looking for two sites in Coventry as well as sites in Edgbaston/Selly Oak, Wolverhampton and Worcester. Overall, this equates to an investment of £30 million for third party investors and is expected to create around 125 jobs.